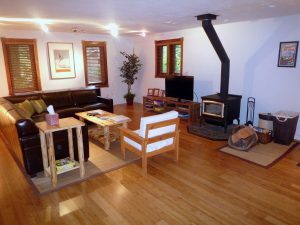 Mt Hood Alpine Chalet is a 3 bedroom, 2 bath home which can sleep up to 8 people. Nestled in the neighborhood of Timberline Rim, it is conveniently located within the foothills of Mt Hood with easy access to all your recreational dreams. 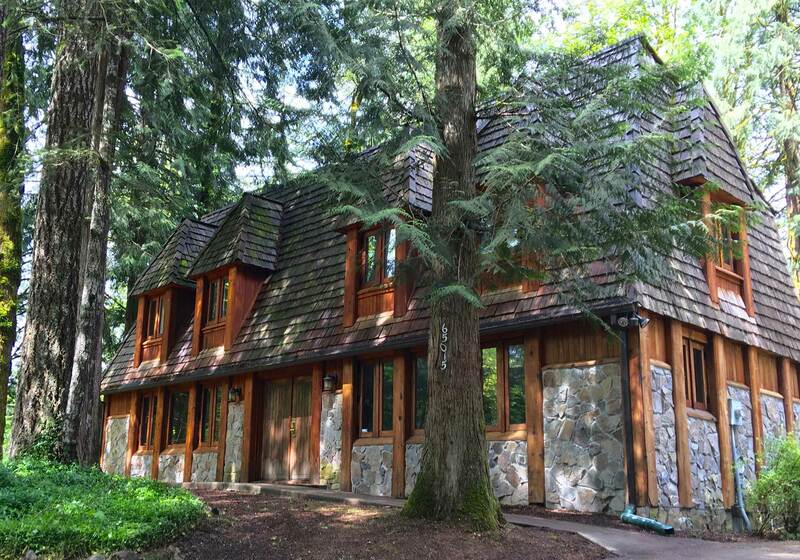 The chalet is 16 miles from Mt Hood skiing and snowboarding, 2 miles from the Sandy Ridge mountain biking trails, and only a one minute walk from the Sandy River, community tennis courts, play area, and summer swimming pool. Inside, cozy furnishings, a wood burning stove, and a lodge-style feel provide a truly inviting space to relax and recharge. Lounge on the sectional sofa in the living room, complete with a flatscreen TV, cable, complimentary WiFi, and games to keep you entertained. In the fully equipped kitchen, you’ll have all the essntials for cooking your favorite dishes. Rustic wood cabinetry creates a cabin feel, while stainless steel appliances offer modern amenities. For a breath of fresh air, head out to the beautiful back deck space. It’s covered so you can enjoy the outdoors rain or shine, plus there’s a six-person dining table for enjoying alfresco meals. After grilling up some family favorites on the gas BBQ, soak away the day’s worries in your private hot tub. 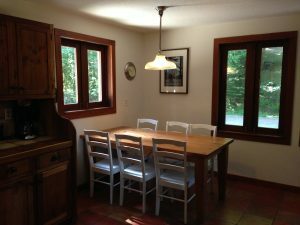 With three bedrooms and two bathrooms, this home will accommodate up to eight guests comfortably. 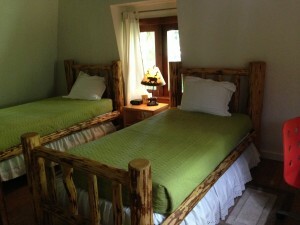 The first two bedrooms each have a queen-size bed, while the third has two twin-size beds. There are two full bathrooms with updated finishes and rustic decor, plus a sofa bed for additional accommodations, and a private washer/dryer for your convenience. When you’re ready for a refreshing swim, enjoy access to the nearby community pool that’s open in the summer months. From strolls along the Sandy River to mountain biking at the Sandy Ridge Trails just two miles away, there’s plenty to do when you want to enjoy the outdoors. Pick up some canoes, paddle boards, or kayaks and head to Trillium Lake for endless fun in the sun. You’ll find local restaurants and amenities a short drive away along Mt. Hood Hwy, plus more options at the nearby town of Welches. In the winter, this area offers stunning scenery. From snowshoeing through the snow-capped pine trees of Mt. Hood National Forest to skiing up at SkiBowl, Timberline, or Mt. Hood Meadows, take your pick of amazing recreation options in the winter. 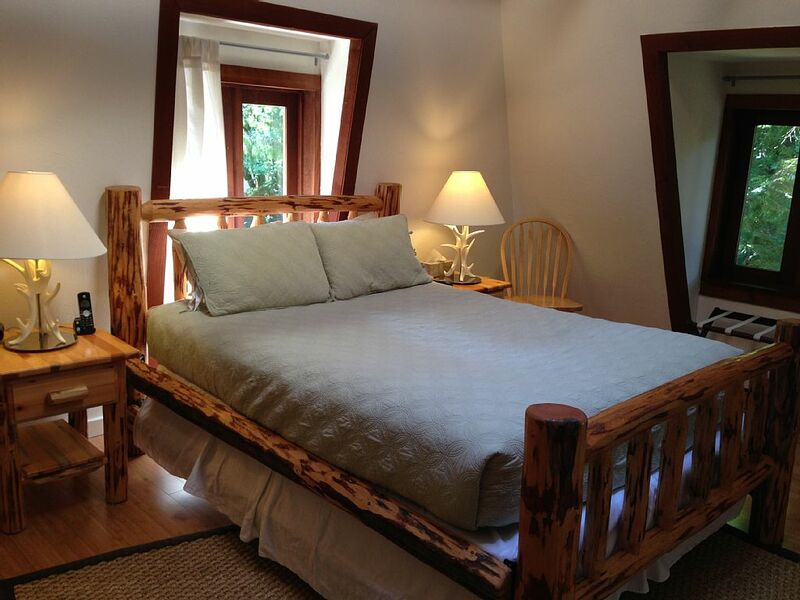 Plan a cozy getaway to this adorable chalet-style home in Rhododendron – book your trip today! To check availability and book your vacation visit Mt Hood Alpine Chalet on vacasa.com. Sandy Ridge Trail System some of the best mountain biking in Oregon and only 2 miles from the chalet! Timberline to Rhododendron/Tollgate once the snow is gone at Timberline you can ride 17 miles downhill from Timberline lodge to Rhododendron. If you don’t want to shuttle with two cars, use the Mt. Hood Express shuttle. It’s equipped with bike racks and will take you from across the Dairy Queen in Rhododendron all the way up to Timberline lodge for only $2! For a shorter ride, just do Timberline-to-Town between Timberline and Government Camp. Skibowl Moutain Bike Park 40 miles of trails. Also has bike rentals, and tours. The Sandy River is a one minute walk from the front door! Drive east on interstate 84 until you reach exit 16 for Mt. Hood/Wood Village. Take a right off of the exit ramp light and head south on 238th Avenue and continue south as this road becomes 242nd Avenue. Turn left onto Burnside Boulevard and head east until you merge with Highway 26. Turn Left on E Brightwood Bridge Rd (between the Brightwood Country Store and the red Brightwood Tavern). After going over the Sandy River bridge, turn Right on E Barlow Trail Rd.